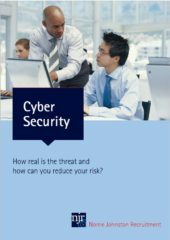 Cyber Security - Norrie Johnston Recruitment Ltd.
Cyber Security: How Real is the Threat and How Can You Reduce Your Risk? Cyber security is a topic that’s high on everyone’s agenda. The impact of a cyber attack can be immense, from both a technical and reputational point of view, which is why we’re seeing more and more companies recruiting in-house cyber experts.